It’s beginning to feel a lot like Christmas around here, even if maybe it doesn’t look much like it yet. The week started with bright blue sky, puffy clouds, and temperature in the 70s, but by the weekend a cold front had moved through and now we have cloudy skies, blustery winds, and temperatures in the low 40s. Tomorrow is my brother and sister-in-law’s birthdays, which means in a month I will be celebrating my birthday, and then Christmas will shortly follow. I must admit that I love this time of year. I haven’t started listening to Christmas Carols (even though one of the radio stations began playing them on November 1st), but now that the weather has turned chilly, I am in the mood to think about this festive time of year. I treated myself to a trip to Archivers earlier this week. I rationalized that it was for “research” for my book, but in reality I wanted to get some ideas for Christmas projects. I love daydreaming about all the scrapbook pages that I can make to turn our family memories into keepsake gifts, and I imagine crafting Christmas cards and matching tags to decorate thoughtful presents under the tree. But for some reason I seem to enjoy daydreaming about the projects rather than creating them. I never make the time to complete them once I get home. Why is that, I wonder? It was an uneventful, although somewhat frustrating week in the teaching world. The computer lab did not have internet all week, which makes Computer Apps a difficult class to teach. Grandparents Day was so popular that the 4th hour class, which was scheduled to take a test over Fahrenheit 451, was cancelled because not everyone could get through the lunch line in time. Missing this class as well as last Friday’s class has put my syllabus in a bind. And then of course students, as well as teachers, are anticipating the Thanksgiving break and therefore find it more and more difficult to concentrate on academics. I am grateful that we only have one more full week of school and then we can take a holiday for a few days. On a positive note, I took advantage of Barnes and Noble sale last weekend that offered one game free if two were purchased. I managed to find a couple of Christmas gifts, and the free game I chose was a small, compact dice game called Rory’s Story Cubes. I had never heard of it before, but it turned out to be a better “purchase” than I ever anticipated. The game comes with nine dice, and each side has a different picture/icon. The object of the game is to roll the dice and quickly develop a story using as many of the pictures as possible. I tried this first with my creative writing class and they LOVED it! They developed competitions to see who could use all the pieces in the shortest amount of time. And of course, their stories were inventive and quite entertaining. Sometimes spontaneous purchases can be the best! This is the time of year when the new reading challenges for 2011 are being formed and advertised at one of my most favorite blogs, A Novel Challenge. Some people are so creative and have taken reading to a level that I never imagined before starting this blog. I fail miserably at challenges: My imagination is always bigger than my reality and I constantly seem to run out of time, or at times lose interest in that particular genre. But will that stop me from signing up for a few more next year? Of course not! I would love to participate in the Thankfully Reading Weekend challenge 2010, which takes place over the Thanksgiving holiday weekend, but I know that my time is already being pulled in too many different directions during those few short days. Between holiday baking, Black Friday shopping, NaNoWriMo wind down, and essay grading, I doubt I will read more than a few pages each day. I did participate last year and thoroughly enjoyed myself. 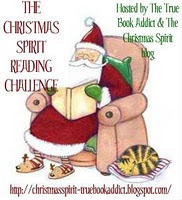 I have already decided to sign up for The Christmas Spirit Reading Challenge hosted by Michelle at the True Book Addict and takes place from November 26, 2010 – January 6, 2011. I know …. I hear you … Are you kidding, Molly? You haven’t written a book review in months, why on earth would you sign up for another challenge? Well, the answer is simple. I decided last year that I wanted to begin a collection of holiday books that I would read each year. I may not read all of the books every year, but I would re-read a few each year to help put me in the holiday mood and remember the hope and love that it represents. I don’t think any of these books are dense literary masterpieces, but rather they are light, sentimental stories that are sure to bring a warm smile to my face. I have about a dozen of these books on my holiday shelf and I think reading a bit each night will be the perfect way to prepare my mind and heart for this special season. I plan to sign up for the Mistletoe level (that is, read 2-4 books), although I secretly hope that I can achieve the Christmas Tree level (reading 5-6 books in the required time frame). Do you have any favorite holiday books that you might recommend? This has been a great week of writing for me. As you know, I am a goal oriented, put your head to the grindstone, singularly focused kind of gal. I know that several of my November nights will be spent preparing holiday dinners or grading research papers, and so I have tried to focus all my free time this week to adding to my word count for this work-in-progress. As of Saturday night, I have a total of 39,197 words with the goal of having a total of 40,000 words by the end of the weekend. I must admit that I never thought that I had that many words in me (and I am only about half way through the story), and I do feel a sense of accomplishment. I have learned so much about me and about life in participating in NaNoWriMo – and very little of it has to do with writing a novel. I have learned that writing from an outline is incredibly useful for me! I will finish a chapter and have no idea what to write next; but when I look at my timeline (which I have developed as scene cards in Scrivener and absolutely love it) – I am right back on task again. I always thought true writers would experience “stories just writing themselves” – but I am glad that I did not rely on that method. I have also learned that I have more free time during the week than I ever thought. I manage to find two hours or more each night to devote to writing, which has opened my eyes to what I can accomplish once NaNoWriMo is over! What if I focused on my holiday crafts with this kind of determination? What if I devoted two hours a night to reading? What if I took an hour each day and practiced photography skills? I am not sure how I have been wasting my time — but now that I have found the time, I do not want to “lose” it again. Lastly, I have learned that the experts are right (duh!) Writing every day is liberating and it hones my craft. Even if what I am writing is a crappy first draft (paraphrase of Anne Lamott) – I am able to practice pacing, detailing, showing vs telling, natural dialog, dealing with real life feelings and emotions in a fictional setting and receiving clarity of the situation. I do not think this story will be of much interest to anyone but me, but that is ok. I am still enjoying it, and I still look forward to writing the next chapter. I am a terrific at starting long-term projects, but somehow never finishing them. I either grow bored and lose motivation, or the project seems so insurmountable that I create distractions that prevent me from completing the task. I am committed to completing NaNoWriMo this year, and it feels good. I hope it is a step over that fear of completion hurdle and I can begin to tackle other long-term projects with the same sense of adventure. You're doing great with your writing!! So happy you're able to carve out some time in the evening. It's certainly a big week ahead for HP fans! At least a couple of my girls will be attending the big opening, too. That spontaneous game purchase sounds like a winner! I refuse to think about Christmas until after Thanksgiving but I admire all of you who are better organized and prepared. And writing every day-amen! Even if it is merely stream of consciousness writing, it is certainly craft honing, isn't it? I enjoyed your post today, thanks! I take it you live in a southern climate like me. That sounds exactly like my weather! That's great about your word count!! Congrats on your writing. I'm stuck at 6,000 words and will have to stretch out the time I plan to finish! Rory's Story Dice. I must get me some of those. Sounds like fun. I've been meaning to get Apples to Apples for some time. Do you know that one. I think your creative writing class would enjoy it as well. I've made it a happy to build in "blank" days to my own syllabus so I have a cushion. Helps me keep on pace when classes end up cancelled for unforeseen reasons. I want to try Scrivener at some point, although I don't have it for this challenge. My posted word count right now is 28,161, but this morning I've brought it up to 30,162 so far. I won't post it until I've finished for the day. I hope to add another 1,000 words at least. Congrats on the great progress with the writing. I'm afraid to head over to A Novel Challenge for fear I'll get sucked in again for next year like I did for this year. Although, technically, I should easily have been able to complete all of my challenges–just took on too many review books. But there are so many other things I want to be able to read in the coming year. Love that new game–what a great thing for a classroom. I haven't heard of Story Cubes before either, but it sounds like a great game – especially for a creative writing class. I've managed to finish a lot of challenges this year, but sadly have not completed either of my own challenges. They're not that hard either, so I don't know what's going on there. 🙂 I'll need to put together challenge posts for next year sometime soon, so your talk about the challenges was a good reminder. Oh I hate when we are having computer issues at our school! You can waste so much time, and there is really no way to plan for it. I just heard Story Cube being chatted about on the radio the other day and it sounded like fun. Hmmm. Wow. You have really been working on your novel. I bet that is a happy feeling. I signed up for NaNoWriMo, typed for two days over my lunch break, and decided to give up. I just hate my writing. I love the outline. I love the characters. My writing is absolutely horrifying. I've written other things that were not excruciatingly painful (poems, for example, and little pieces of memoir, as well as my daily journal writing) and I loved writing those, so I am not giving up writing forever. Just this horrible, awful novel. I will officially welcome the Christmas season on Dec 1 and then my work music will consist of Christmas tunes for sure. I love Archivers!! My good friend and I try to scrap all day there a few times a year!!! Have a wonderful week Molly!!! I am so pleased that you are embracing NaNoWriMo and I am so impressed by how much writing you have done. I am glad you found some down time for yourself during the day. I am putting up a post on Wednesday with a long list of Christmas novels in, if you are interested for your reading challenge. I will be jumping feet first into Christmas once I get my writing finished. Isn't it amazing the time we find in our overloaded schedules once we focus on a goal? I'm so happy that you have found the time to write. I know you will have a wonderful sense of accomplishment and a really great story when all is said and done! I can't seem to get in the Christmas or even Thanksgiving mood. We have temperatures near 80 degrees here in California so it is hard to feel like it is Fall. I admire your ability to focus and get things done. I am feeling a bit overwhelmed and that holiday sadness seems close by. (It's tough when most of your family has passed, just the husband and two kids now). That game sounds really neat. I'm going to have to look for it. Praise God for your labor, Molly! Isn't it great that when you're a writer, EVERYTHING is research?? Hope you're having a truly love week.